Dom Dom Burger, Japan’s first fast-food hamburger chain, has rolled out a limited edition cheeseburger, which features two beef patties, onions, tomato, a slice of yellow cheese and Camembert cheese for buns. Goodness. That’s right, thick slices of Camembert cheese take the place of buns. No doubt Dom Dom Burger is offering such a strange burger because it has to compete with behemoths like McDonald’s. The burger itself is 980 yen ($8.82), and there are meal deals with a drink and fries. 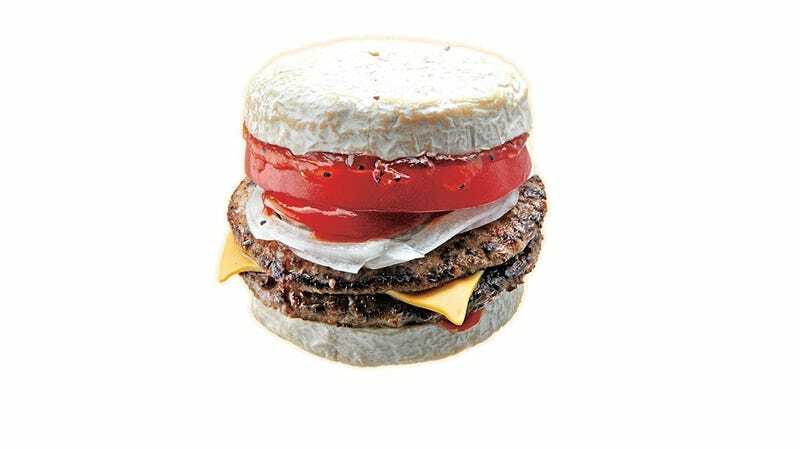 The Camembert Burger will be available until August 31. Supposedly, it’s good if you are into cheese, burgers and calories.